This is a book about reading a book, which turns into a different book. But it all ends happily! 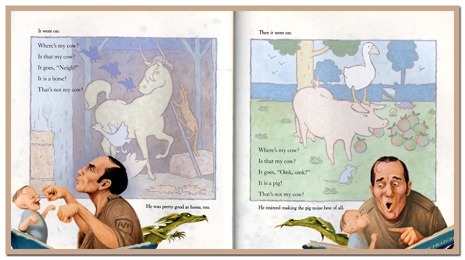 Every day at 6:00pm sharp Sam Vimes reads the book “Where’s My Cow?” to Young Sam. But one day Vimes decided that it makes no sense to read about animals which Young Sam will never see alive. Therefore, he changes the story of the book a little to be more interesting for someone living in Ankh-Morpork. Where’s My Cow? is an illustrated novel. However, it is not comparable to previous illustrated novels as Eric and The Last Hero, because its appearance is that of a children’s book. It is intentional and suits the story that some of the drawings could have been taken right of a book for two-year-olds. There is very little text in the book which has only 14 pages. Nevertheless, this great book shows Commander Vimes in a totally different light as in the Watch Books and is therefore a “must have”. A spin-off from Thud!, this is a book ostensibly aimed at very young children. In Thud!, this is the very favourite bed-time reading for Young Sam Vimes – the chew-marks on the cover are an endorsement of its all-time-favourite status. Young Sam must never be without his father at six in the evening for his night-time ritual. This is the thing that keeps Samuel Vimes straight and reminds him that he is more than just a policeman – the six o’clock ritual is something he never misses, and it ingrains such a habit in him that he will do positively insane things to be home an up in the nursery at six o’clock, every evening, without fail. This becomes an integral plot-device of Thud! – the deeply ingrained, almost magical, habit of sanity and normal fatherhood presents the very last insurmountable barrier that not even the Summoning Dark can break. Therefore, how could this book-within-a-book not make it out of the pages of Thud!,and be published in its own right? Terry Pratchett’s text and the artwork of Melvin Grant combine to present a different sort of Discworld, with many of the familiar characters re-imagined through Grant’s lovely artwork. Reviewed favourably in the Ankh-Morpork Times by its renowned literary critic, Tuppence Swivel.